Agility is the fastest growing dog sport in Canada! Both dogs and their owners can enjoy the fun and excitement offered by the sport of agility. Agility involves the dog owner (called the handler), the dog, and a series of obstacles (referred to as agility equipment). Agility handlers instruct their dogs through obstacle courses, which contain a variety of equipment, using only their voices and body language. Dogs enjoy the challenges, speed, and exercise that the obstacle courses provide. Shy or timid dogs build confidence by working through unknown situations and by mastering the agility equipment. In training to guide their dogs through the equipment, handlers learn just how smart their dogs really are. Agility training together as a team builds a strong bond between the handler and dog! Agility is for all types of dogs and owners. Many seniors are actively participating with their dogs in agility training and trials, as are junior handlers. Whether for recreational activity or competitive trials, agility training provides both dogs and their owners with hours of fun exercise! There are even three-legged dogs performing successfully in agility! To perform in agility, however, dogs must be healthy and not overweight. Good exercise for you and your dog. Fun for you and your dog. Improve the working relationship between you and your dog. Meet new friends – human and canine. Learn just how smart your dog is! Build confidence in a shy or timid dog. Strengthen the bond between you and your dog. Learn new skills and tricks. Gain the satisfaction of setting personal goals and achieving towards them. Dog agility first appeared in England in the 1970’s as entertainment at dog shows and agricultural fairs. The obstacle courses were inspired by jumping events at horse shows. People enjoyed watching dogs perform so much that agility quickly became a competitive sport and spread to other countries. There are even dog agility games for mobile devices! Agility has been thriving in Canada for about 2 decades now. 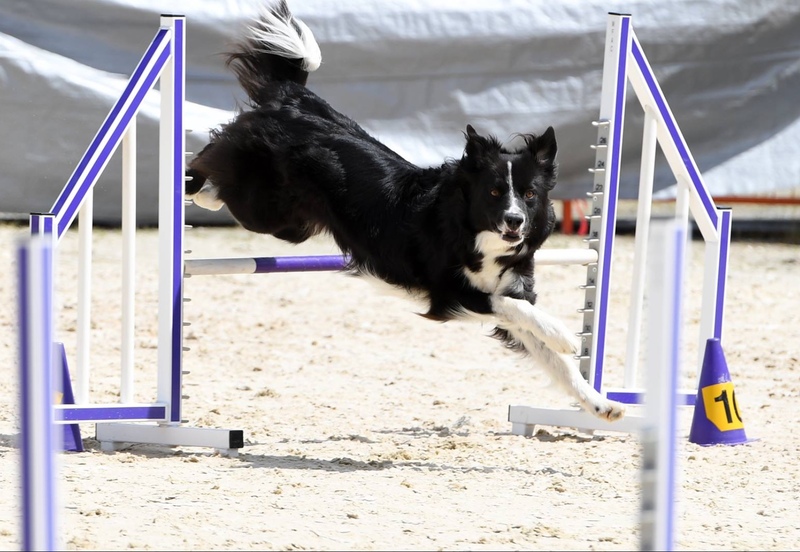 Most communities have active agility clubs and access to competitive agility trial events. 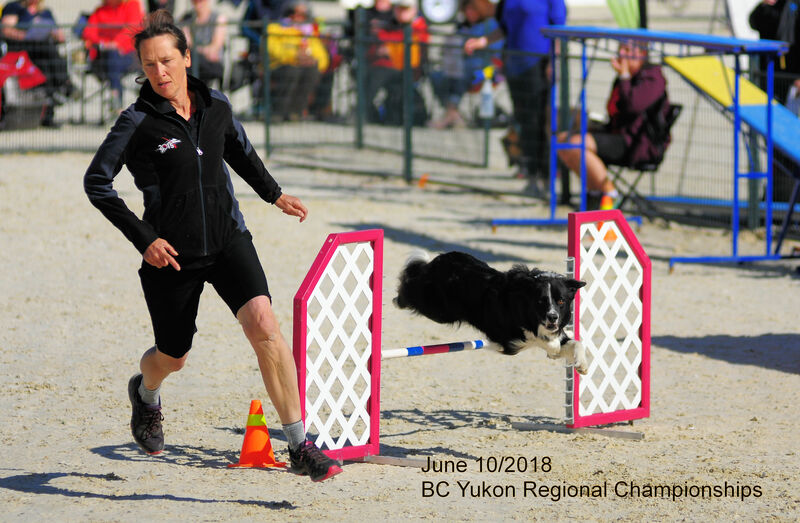 At the international level, the Canadian Agility Team represents Canada at the World Dog Agility Championships! Agility equipment are obstacles that a dog must learn to go over, around, through, or on. An agility course is made up of a series of different types of agility equipment. A–frames – Two planks hinged together into an A–shape, a dog must make contact with its paws when ascending and descending the planks. Teeters – A plank balanced on a pivot like a child’s seesaw, the dog must contact the plank with its paws as it passes over the obstacle. Raised dog walks – A raised platform with a ramp at either end with areas where the dog must make contact with its paws. Tire jumps – A hoop that the dog must jump through. Hurdles – Horizontal poles that the dog must jump over. Tunnels – Fabric cylinders that a dog must pass through. Chutes – Tunnels with a piece of fabric over the end that a dog must push its way through. Weave poles – A series of vertical poles, like a ski slalom, that a dog must weave through. Pause tables – A raised platform on which a dog must get up and sit or lie down. In agility, handlers train their dogs to navigate the various kinds of equipment. In competitions, judges design courses depending on the event and the ability of the group (Starters, Advanced, or Masters) competing.